All Sunday afternoons should begin with an Afternoon Tea at Burnham Beeches Hotel. Mini-cakes, fresh scones, hot tea and coffee, even a glass of bubbles can be arranged if that’s what you fancy. I’m with the latter. Nothing beats a good afternoon tea with a glass of champagne. Last Sunday I was invited along with my friend Michelle from Brown Bear Bakery to try out the Afternoon Tea at the recently launched Laura Ashley The Tea Room. Where is Burnham Beeches Hotel? Set in the beautiful Burnham Beeches Hotel just near Slough, a few minutes drive from Junction 7 of the M4, the hotel is handy to get to from most areas of the South East. I reckon if traffic is good, 30 minutes tops from London. Also, turns out Michelle makes for a pretty good blogging side-kick! Asks questions, reviews honestly, crawls on the floor to take photos… 😉 She’s definitely invited on the next one! Set in beautiful landscaped grounds, Burnham Beeches Hotel provides a comfortable yet luxurious home-from-home. I’ve actually written about how lovely the hotel is before. Back in the summer, I set up a wedding cake in the hotels Georgian Suite, which you can read about here. We were greeted by restaurant manager Fernando who was very helpful and professional. We sat at a lovely window table where we were handed a simple but mouth-watering menu. Fernando then explained all the different options, asked if there was anything we disliked or preferred whilst helping us feel very welcome and at home. The Tea Room is decorated in signature Laura Ashley style. Beautiful floral prints in muted colours are complemented by pastel painted walls with a grape colour feature wall. The bright and airy space with high ceiling and large windows, complemented by classic architectural features, makes for a striking backdrop against the soft furnishings and decorative items. Pretty ornate mirrors, ornaments and a small selection of vintage teapots, create an elegant and comfortable space. Perfect for indulging in the most British of events. Michelle and I were the only ones in the room for pretty much the whole time so we really got to have a good nosy around. Testing out all the chairs and sharing lots of “oooh, look at that this teapot” kind of moments. Which I realise probably sounds absolutely bonkers, but the little extras in the tea-room really do make all the difference. If there’s one thing I thought would have made it even better, it would be to maybe have a little bit of soft music playing in the background. As the room is quite intimate I imagine that when full the atmosphere would be a little livelier, but with just a few guests there’s the chance people would be whispering and worrying about making too much noise. Music would soften that a little bit. Ease the pressure of trying to not interrupt others. Drink orders were taken, both of us opting for the fizzy type to begin with. The sparkling wine for Michelle and the champagne for me. We did have tea and coffee later, as no afternoon tea would be complete without them, but they did arrive a little too late which was odd. I like to have my hot drink with my food and I *think* its quite normal to have tea with your scones right? Either way, I’m sure this was just a teething issue and the lovely waitress just wasn’t aware that it should be brought out earlier. As expected when having afternoon tea, British classics were served on a delicate stand, one per person, and included a selection of dainty finger sandwiches with freshly baked scones with artisan jam and Cornish clotted cream. 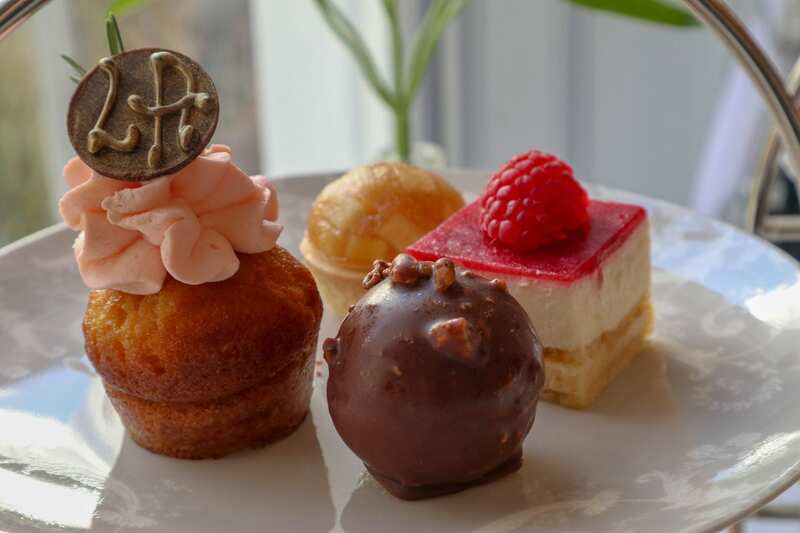 The afternoon tea’s fancy cakes and patisserie include modern interpretations of British classics created using seasonal produce by Head Pastry Chef, Laura Zilio. I loved them all! Nearly… I’m not a big fan of rose flavoured desserts but I know I’m probably in a minority, but it did look very pretty with a fresh plump raspberry on top and I’m sure for most it would be delicious. My favourite cake was probably the chocolate one which was incredibly rich but sweet and had a melt in the mouth caramel centre. Ultimately though the scones were what made my day! No lie. They were warm, light and perfectly baked so they had the most amazing melt in the mouth taste. After a very in-depth discussion and experiment about what goes on first, jam or cream, Michelle was totally right and jam first works the best – every time! The opening of The Tea Room is the first stage of Burnham Beeches Hotel’s re-branding to become part of the Laura Ashley Hotels portfolio. In Spring 2019, the elegant 82-bedroom Burnham Beeches Hotel will be refurbished in line with Laura Ashley brand standards and will showcase the Laura Ashley Home range and its exquisite, inherently high-quality British fabrics and furnishings throughout. With prices starting from £24 per person its great value for money. All diets and food preferences are catered for and you really will have a lovely day out. Maybe you’re looking for that perfect Christmas present or just want a little treat for yourself? You can make a booking right here. "(AD) Franco Manca Sourdough Pizza Masterclass in Reading"